Our Mukti Tribe not only practices physical yoga, but we also “live our yoga,” acting out in service, compassion and concern for all. Heather Archer, your Yoga Muse, is a native Californian. Growing up in Manhattan Beach, Ca. her backyard has always been the sand and the sea. Using the ocean as one of her first teachers, Heather learned to move and flow with the current of life. Also spending time in Santa Fe, New Mexico, Heather strengthened her spiritual connection to Mother Nature, and Self. Playing competitive volleyball and creating a successful career in Fashion, was a dream come true. But in 2006 she found herself yearning to get back to her roots. She was in need of a new creative outlet, a pause from her fast pace life. That’s when a dear friend suggested yoga, and the evolution began! After practicing consistently for a year, Heather had found her flow. She realized she had a strong personal passion for yoga, and the desire to share this passion with others as well. After experiencing, the positive physical, mental, and spiritual effects of her practice, it was clear that her path would lead her to becoming a teacher. The gift of light and self awareness that her teachers have shared, is the most vital aspect of her yoga journey, and the most cherished. 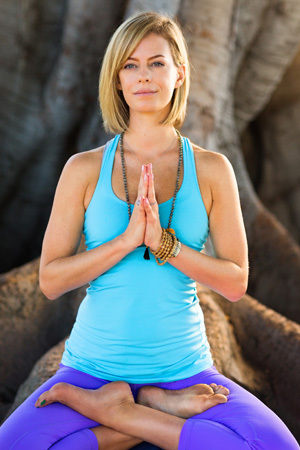 In 2007 Heather became a certified yoga instructor through the Mukti Teacher Training Program, with Julie Rader. She has been teaching all levels of Vinyasa Flow classes for the past 7 years. Yoga Alliance certified 500RYT, and a Lululemon Ambassador since 2012, Heather also continues to lead Yoga Retreats locally and internationally. The practice of yoga transformed Heather’s life and allowed her to achieve her goals of balance, strength, and tranquility. She continues to expand her practice through advanced yoga studies and a deep personal yoga practice. In her classes, Heather’s intention is to Inspires each student to MOVE into their full potential. Creating a space of UNITY where they can heal and grow physically, mentally, and spiritually. STRENGTHENING their connection to Source and Self…ultimately EVOLVING! MUSE noun. a guiding spirit. A source of inspiration. Linda Baffa is a singer, a mama, a foodie, a free spirit, and a truth seeker. She teaches a strong, alignment-based, breath-filled vinyasa flow style that seeks to find balance, peace, clarity and contentment. Linda’s classes aren’t just going to strengthen your body and soften your mind, but they are also going to make you think about your life, what changes you want to see, and how you can be the best version of yourself. Along with public group classes, Linda enjoys working privately with students, helping to individually refine their postural alignment, guide them through meditation, and release any mental or physical discomfort. She also leads yearly workshops, teacher trainings, and retreats. Aside from yoga, Linda is an accomplished singer-songwriter and enjoys connecting the beauty of music with the beauty of yoga, often chanting lullabies and inspiring ditties in savasana. May you breathe, smile, and live your best life! For Caroline Béliard-Zebrowski life is a journey, not a destination. She grew up traveling the world with her family exploring some of the most beautiful corners of our planet. Then she came across snowboarding and found herself touring the globe again, chasing the endless winter and living an inspiring life filled with competitions, photoshoots and powder days. After having suffered several injuries, Caroline started on yet another journey: She discovered her deep passion for yoga which not only helped her getting back on board but also became a way of life. “Yoga helps me to learn more and more about myself every day”, says Caroline who teaches an original approach that respects the seasonal rhythms and encourages her students to find their very own “sadhana” (personal practice) in order to achieve a happy and balanced life. Why not join the journey? 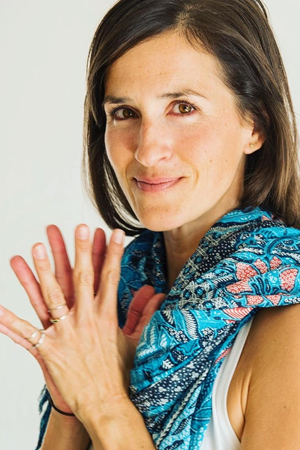 Caroline Béliard-Zebrowski, born 1983 in France, has obtained certification from the Mukti Yoga School in California that was founded by Julie Rader. She also studied Hatha Yoga in France and is doing regular advanced trainings When Caroline is not teaching classes in her yoga school at the French Atlantic Coast, she loves going surfing and snowboarding with her husband Gary and her little daughter Tya. I teach by the most important rule my guru ever taught me, “Love holds the highest vibration.” I am a 500-hour Registered Yoga Teacher, senior teacher trainer for Mukti Yoga School, lululemon ambassador, CAADE certified addiction counselor (expected), founder of Yoga High, Inc., & creator of the Yoga High podcast. I teach yoga as a self-care practice for mental health, specializing in mindfulness and embodiment-based techniques for personal happiness. I also have an ‘interdisciplinary humanities’ degree written in Latin from Wash U in St. Louis filed away in a drawer somewhere… I originally hit the mat because I wanted nice arms for my wedding dress. Within three months, my arms were rocking. Within six months, I was sober. I wondered, “How the heck was it that easy?” I became passionate about the proven methods and techniques of how and why yoga heals the brain. I’ve studied with everyone from Harvard neuroscientists and licensed therapists to Reiki masters and sound healers. My work is both clinical and energetic; I think of it as hard science with a soft heart. It is my ability to seamlessly blend time-honored yoga traditions with high-level science that makes my teaching unique. I believe all lives improve with the loving feelings of a really great yoga high. I believe in plasticity of the brain, in growing the insular cortex, that love heals all things, and that the full moon makes people a little crazy. Basically, I love understanding why yoga heals, but I also acknowledge some things are beyond understanding. I teach “Rad Yoga for Radical Change,” and I live it every day. Christy Evans is a teacher of yoga, qigong, and meditation. Christy offers her students and clients a heart-based approach to growing personal edges and stretching for a purpose on and off of the yoga mat. She believes in the benefits and power of play as a way of remembering our true nature and is passionate about guiding individuals toward the divine play within, Lila (lee-lah). Alignment, breath, and visualizations are woven into her teachings to deepen the connection to our body and the world around. Christy offers enriching online yoga and meditation videos as an expert instructor with Grokker, which is an online resource that supports people’s passion through high-definition video. 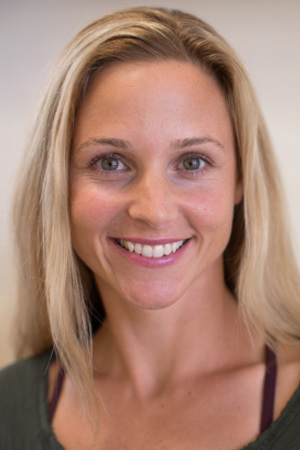 As a senior teacher for Mukti Yoga School, Christy leads certified yoga teacher trainings as well as regional and international wellness retreats. Through her background as a collegiate athlete and passion for supporting individuals and teams in reaching their highest potential, Christy offers the practices of yoga, qigong, and meditation to the professional athletes of the San Jose Earthquakes of Major League Soccer. Christy’s teaching roots are inspired by a desire to work with individuals to maintain wellness through pre-habilitation which was discovered while working for years as a medical speech language pathologist. Her diverse interests and experiences established the roots and solid foundation from which she draws upon today. 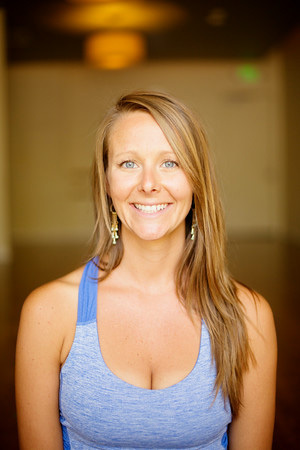 Christy is a 500-hour registered yoga teacher under the certification of Julie Rader Wellman with Mukti Yoga School. Christy is grateful for the teachings of Sianna Sherman and Noah Mazé for establishing her yoga teaching roots in alignment and grace. Additional certifications and trainings with Triloka’s medical qigong and Mattamayura Institute’s non-dual shiva tantra are integral to her path and the teacher she is today. Jaclyn is originally from Greensboro, North Carolina. After living and teaching yoga in the beach communities of Los Angeles since 2007, she has moved back to NC with her husband and new baby boy! She is excited to be closer to family and to connect with a new yoga community. Jaclyn teaches a strong, balanced, and playful vinyasa flow. Her love of yoga comes from gratitude for its transformative nature and loves sharing her practice with others. She feels it’s also important to laugh and smile along the way, carrying a sense of humor with you on and off your mat. It is her wish to help you clear your mind, improve your physical health, balance your emotions and connect with your heart. 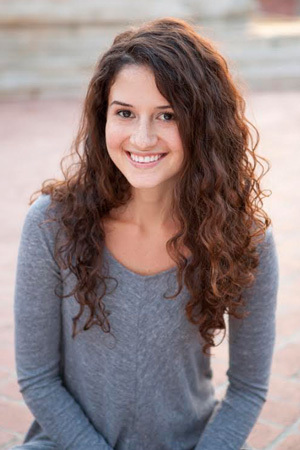 Jaclyn is dedicated to the study, teaching and practice of yoga. Jaclyn’s love of yoga is contagious! Jamie is all about the breath…and movement…in unity. She skillfully designs her classes using a unique blend of Hatha Yoga poses that build an intelligent, purposeful sequence. Jamie’s music selection helps transcend you into your practice so that it becomes a moving meditation. She builds the sequence with the music; just like a soundtrack to a movie. Having practiced and taught Vinyasa Flow Yoga for several years, and having completed an eclectic array of Yoga Teacher Trainings, she creates an environment where movement becomes liberation. She learned this through the Mukti School teachings. Jamie strongly believes that every pose should have a purpose and will ultimately lead to a deeper, more advanced posture. Jamie also believes in allowing the student to be their own teacher, while listening to their own body, and being guided by their breath. She opens the body in a way that not only frees your mind, but is also fun, feels good, and is safe on the joints. Lauren was born and raised in Massachusetts. 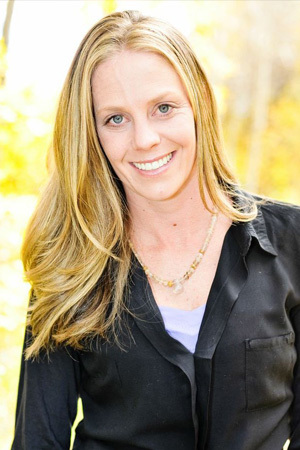 She moved to Southern California and Oregon as she has a passion for a healthy lifestyle. Her background is in Holistic Nutrition, Personal Training and Yoga. There was a challenging time in her life where she began to practice yoga regularly with no expectation, except for maybe some inner peace. But what Lauren found was a power within! There was a pose that would normally bring her to her knees, at that time she did not believe she could do it. So she asked herself to believe, just like that she came into the pose with grace and ease. In that moment she understood the power of yoga. It changed her life and she became a teacher! The tools we learn from the journey on our mats are the same tools we can utilize off of the mat! Yoga strengthens the body, the mind and spirit. Lauren is grateful to watch people’s lives improve from the practice of yoga…. Danielle is a sense of stillness in an often-chaotic group. Guiding people into a more peaceful way of being is Danielle’s true passion. Danielle has found the following quote comforting throughout her life and reflects upon it often. “Peace. It does not mean to be in a place where there is no noise, trouble or hard work. It means to be in the midst of these things and still be calm in your heart.” -Unknown. 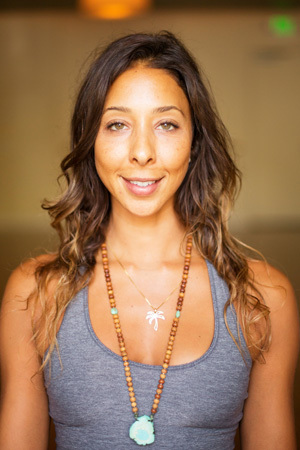 Danielle is enthusiastic about weaving mediation, asana, and a deep love for community into her class as she guides people towards physical and spiritual growth. As a result of her ongoing studies of yoga and Neelakantha Meditation she offers a dynamic, energizing class focused on physical alignment, attention to detail, and wisdom. Through immersion into the physical, mental, emotional, and spiritual bodies, Danielle believes great transformation and healing can occur. Though she has dedicated the past 16 years of her life to yoga and mediation, she is an extremely proud mother of two children, and wife to an amazing husband. Being married to a former professional athlete, Danielle’s life has led her to many different countries and cultures. Through an ever-changing landscape she has learned to put down deeps roots with practice, study, and teaching. She is particularly dedicated to her meditation practice, which helps her find peace wherever she may be. As a passionate mother, she also loves guiding people through a healthy and informed pregnancy and childbirth. Danielle is a certified Khalsa Way Pregnancy yoga and mediation teacher. Danielle is grateful to be part of the inspired Mukti Yoga Staff, where she has found her true voice as a teacher. She is encouraged to lead a physically, mentally, and emotionally powerful class with deep attention to anatomical awareness. She leads foundation and graduate trainings for Mukti. 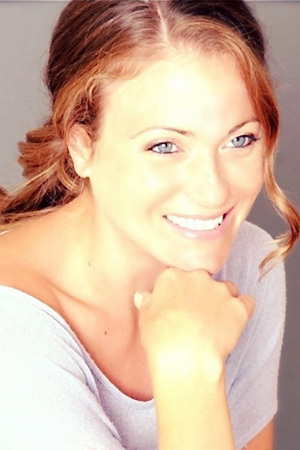 Chelsea Rothert specializes in Power Vinyasa, Restoratives, Therapeutics and Pre/Postnatal Yoga. She is also a DONA certified Birth Doula and Childbirth Educator; helping guide women mentally and physically through a natural labor. 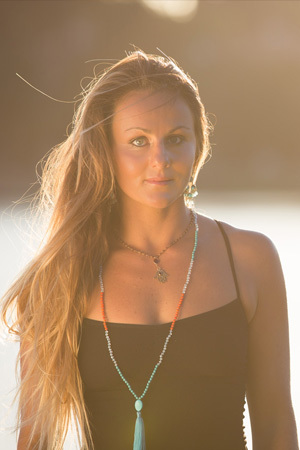 She began her own yoga practice in 2004 and began her teaching journey in 2007 while living on the Big Island of Hawaii. She now has over 500+ Hours of yoga training with and leads multiple teacher trainings with The Mukti School of Yoga throughout the year. Currently residing in Manhattan Beach, California with her husband Matt Rothert, she offers weekly Yoga Classes and continues to lead Yoga retreats both near and far. His smile says it all. This guy loves yoga. During a challenging time in his life, Matt Rothert walked into Julie Rader’s yoga class and he was forever changed. He found a deep spiritual connection and the community that he had been longing for. Yoga began to transform every aspect of his life. 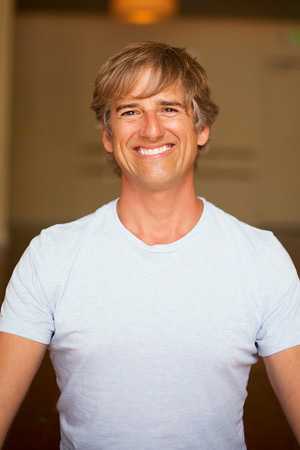 Matt began his teaching career in 2009 and since then has earned over 500 hours with the Mukti School of Yoga. He loves sharing the transformational effects of yoga with his students and believes that yoga can improve anyones state of mind and therefore their life. He currently teaches Vinyasa Flow and Restoratives. His love for yoga and food can be found on his blog.